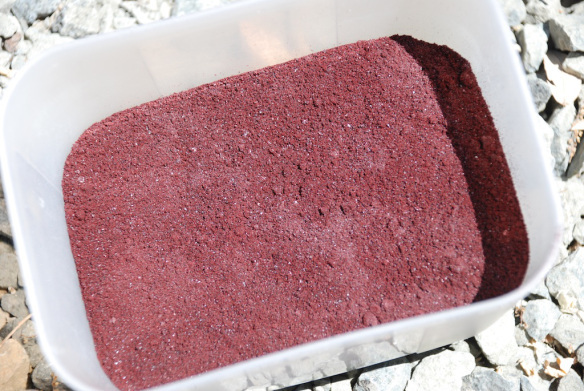 Did you know that you can get a beautiful natural dyed RED from bugs?Cochineal (Dactylopius coccus) grows on cacti of the Opuntia family (prickly pear cactus) and is native to tropical and subtropical South America and Mexico. 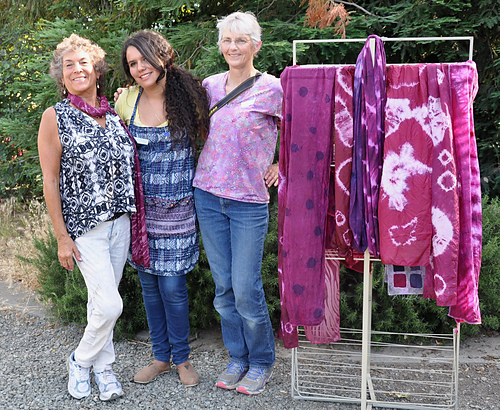 Recently, I sponsored a Cochineal Dye Workshop at Meridian Jacobs Farm with owner, Robin Lynde. 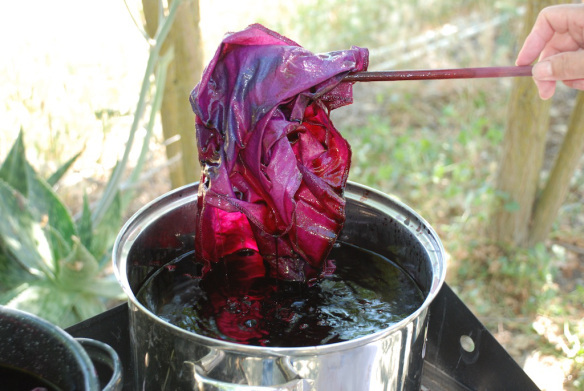 Rocio Mena Guitterez (our gal from The Natural Dye Project: see her blogs) came from Mexico City to share her knowledge of the process of turning dead bugs into RED! First we tried our hand at stamping fabric with varying concentrations of mordants and then immersing them in the cochineal dye bath. Note that the background on these remain white because the fabric was not pre-mordanted prior to stamping and when immersed in the bath only the stamped areas took the dye. 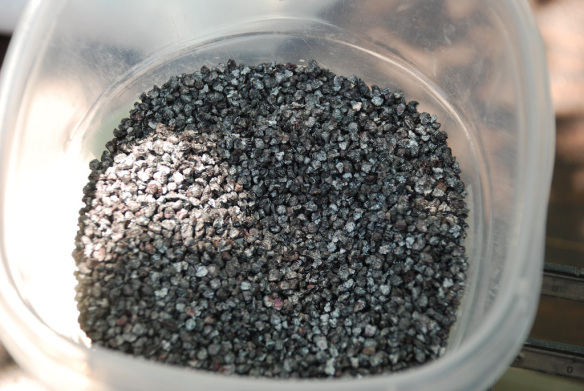 Lots of tiny Cochineal bugs ready for us to grind up into a fine red powder. Traditionally, a mortar and pestle is used to turn the dried cochineal bugs into a fine powder, but these modern-day gals resorted to their handy coffee grinder to do the trick in a flash! Once the water is hot, the fine powder goes into the pot along with a few natural chemicals and is simmered for about an hour. 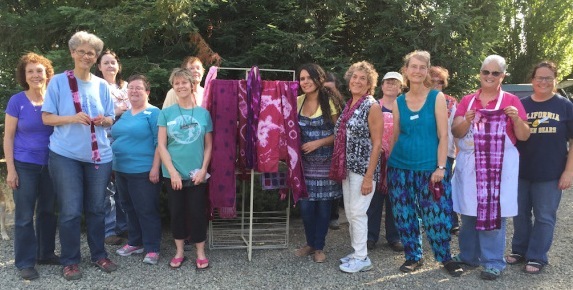 Although we were all anxious to get our cotton and silk scarves into the dye bath, we took a lunch break and patiently waited for the magic to begin! Ah, pure gold, but this time it’s pure RED! 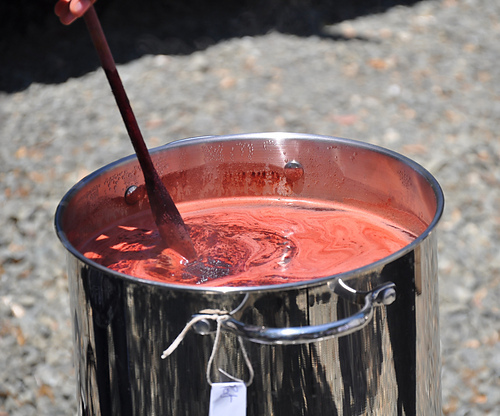 The bath is strained, removing any residue cochineal powder. We goofed, and dropped the strainer and cloth and had to start all over again, but the results was well worth the extra labor! 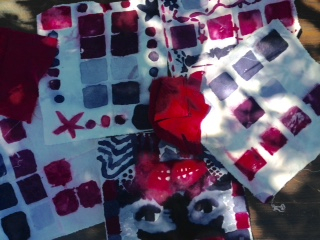 Now the fun of dyeing our pre-mordanted silk and cotton scarves, that Rocio provided, is about to begin! 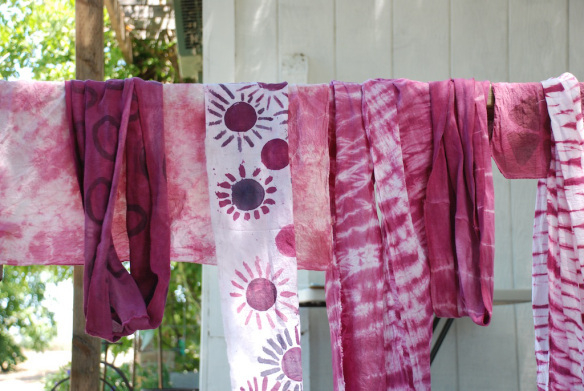 Into the dyepot goes our stamp-designed cotton scarves. 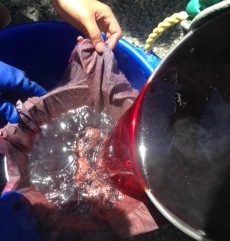 At the end of the day, we were all very happy cochineal dyers, thanks to Rocio! 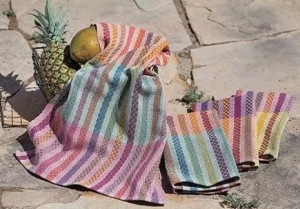 If you don’t have time to dye your own cochineal yarns, order our Friendship Towel with Tintes Naturales kit to make towels, vests, jackets, baby blanket and more! 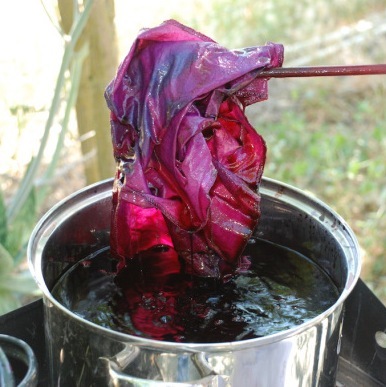 The cotton yarns are dyed with cochineal, osage orange, madder and indigo! Hi. I used to live in Clermont, Lake County Florida. 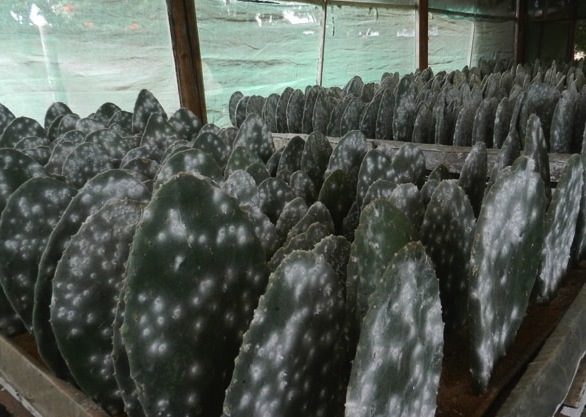 A woman who ran a local nature preserve there actually had cochineal bugs on plants there. She wanted me to come do a spinning demo and she would set up a dye pot. Sad to say, I never took her up on the offer. I hope to come out to Safford to your shop someday. A bit easier now that I am retired. We also have a more dependable car for a trip from Gilbert to Safford. It took me more than few tries to adapt to spinning cotton after centuries, or so it seemed, to spin cotton.